This blog was going to be titled final preparations, yesterday we were frantically running around trying to get all the last bits of shopping and sorting finished for our off on Thursday. 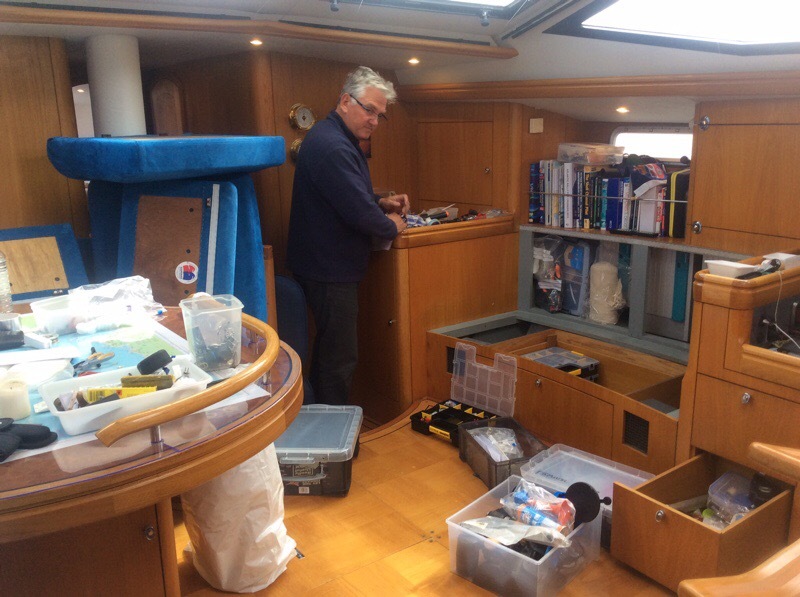 Over the pass week amongst less exciting objects we have puchased two new dive tanks, a passerelle (gang plank) for getting on and off the boat when we are moored stern-to in the Med and two hand held VHF Radios. Bags of spares have been bought and packed away and Tesco has been raided for those UK specialities we can’t live without – HP sauce , Branson pickle, Macleans toothpaste and boxes and boxes of tea bags. Surely there can’t be any more screws to organise!?! Apparently yes. Everything was taken out of the lazarette, before being replaced in a more organised fashion, hopefully having created plenty of room for all the fenders. We felt ready to go. But what a difference a day makes. We are now sitting in the boat feeling rather down hearted. The forecast storm has been battering us all day, we have had sustained winds of 30kts, with gusts of 50kts. There are proper waves in the marina! Being such a heavy yacht we bounce about less than many of the other boats, some of which have looked quite precarious at times but it is still quite rolly and very noisy as the wind roars around us and the waves crash into our hull. And the bad news is that it is now forecast to carry on blowing a gale tomorrow, so although the winds are lower on Thursday, our planned day of departure, the swell in the English Channel will be considerable. If that wasn’t enough there is another storm coming in Friday afternoon and over the weekend. So we could leave Thursday with the swell and wind directly against us meaning a very uncomfortable sail, see how far we can get and then hole up while the second storm comes through or delay our departure until more clement weather arrives. After much discussion we have reluctantly decided to postpone our departure. Looking at the weather in the Atlantic there seems to be a whole set of low pressures lining up to hits us. We may be stuck here for sometime. Could someone please tell the weather it is May not November!!! So sorry to hear about the delay. Its bad enough being on solid ground in this wind! Just don’t use up all your tea bags too soon.